Photo: Patrick M. Tobin (third from the left) receives an honor for utilizing Crisis Intervention Training. Sgt. Patrick M. Tobin, one of the San Francisco Police Department veterans accused last week of habitually harassing a younger officer for his homosexuality, was disciplined in 2001 for leaving a teenager in rival gang territory in the Mission, where the youth was consequently stabbed with a screwdriver. During the same 2001 hearing, Tobin was disciplined for a separate incident in which he kicked a child in the groin. Tobin, who retired last summer, was an officer at Mission Station at the time. This is recorded in the minutes of disciplinary proceedings held by the Police Commission in November 2001. These kinds of proceedings were held in open session until 2006, when the California Supreme Court ruled that disciplinary hearings fall under the state’s police confidentiality laws, which has since kept them closed to the public. Tobin and fellow Central Station SFPD sergeant Lawrence McDevitt were accused in a lawsuit filed against the city last week of, in 2016 and 2017, repeatedly calling an openly gay officer, Brendan Mannix, a “queen” and launching a retaliation campaign against him — including allegedly withholding backup when he called for assistance while handling a robbery case involving a potentially armed suspect. But both sergeants have been accused of wrongdoing before — and were punished for it. On January 18, 1997, Tobin and his unnamed partner purportedly came across two minors huffing material that smelled like “automotive octane booster” from a paper bag on the corner of 19th and Capp, according to the charges recounted in the Police Commission minutes. Tobin and his partner ordered the youths into a police vehicle and told them they were going to Mission Station. Instead, Tobin and his partner took the two minors to the intersection of 24th and Alabama Streets, known as “Norteño” gang territory. They did this even though one of the youths was wearing a blue sweater, the color of the rival “Sureño” gang, according to the charges. The officers then “dropped off” the two kids and left, “driving around the block,” the charges state, as the two kids tried to run from a group of Norteño gang members. The youth wearing the blue sweater fell, and the gang members subsequently “attacked and stabbed him with a screwdriver,” according to the charges. Tobin and his partner found the injured boy with three gang members standing over him, chased them off, and called an ambulance. Only two days earlier, according to the same disciplinary hearing transcripts, Tobin and his partner found two youths hanging out on a park bench at 20th and Treat at 6:30 p.m., after the park was closed. They searched the kids — but before sending them on their way, Tobin kicked and/or kneed [the youth] in his groin area,” the charges state. “When [the youth] doubled over in pain, the [Tobin] kicked and/or kneed [the youth] on or about the face or head,” the charges state. Tobin and his partner denied the allegations, but “civilian witnesses observed [Tobin] kick and/or knee [the victim] in the groin area and on or about the face or head,” state the charges. The charges were approved by then-Police Chief Fred Lau, and were sustained unanimously by the five-member commission. Tobin — who was known around Central Station as “Grumpy” and often sported a t-shirt featuring the Disney Snow White character — was suspended for a total of 30 days for both offenses. McDevitt, like Tobin, took a circuitous path to sergeant. In 1998, his career took an explosive turn when he was arrested on two arson counts after his boat was gutted by a fire as it sat in Gas House Cove near Fort Mason — a blaze that damaged or destroyed three other boats and hospitalized the then-33-year-old cop with burns. While he initially told authorities he’d been singed in a Baker Beach barbecue mishap, McDevitt purportedly later copped to being on the boat. His story: He lit a cigar and the vessel “just exploded,” SFPD spokesman Sherman Ackerson told the Examiner. McDevitt was late on rent and fees for his boat’s berth at the time it went up in flames and had been issued an eviction notice shortly before the blaze. This misadventure, incidentally, came on the heels of a 1997 DUI arrest on the Golden Gate Bridge, during which the sworn officer of the law purportedly registered an 0.17 blood-alcohol content. A plea deal, however, reduced the boat-related charges from felony arson to “recklessly starting a fire,” a misdemeanor. McDevitt was subsequently sued by State Farm Insurance for fraud after he submitted a claim. Both federal agents and State Farm’s private investigators determined the fire on McDevitt’s boat was intentionally set. The owner of one of the adjacent boats sued McDevitt in Superior Court; the case was resolved in arbitration. State Farm, too, reached a settlement agreement with McDevitt. Despite all of the above, McDevitt managed to hold onto his job with the SFPD, get promoted and, by and large, stay out of the news. Until now. Multiple veteran officers — who know and have worked alongside Sergeants Tobin and McDevitt — were confused and disappointed by the accusations. “It’s not the 1960s anymore,” said one recently retired officer. “Being gay is not a big deal” at the SFPD. Several SFPD sources additionally noted that Brendan Mannix is the nephew of recently retired Sgt. Kevin Mannix and his wife, Cmdr. Ann Mannix — meaning Tobin and McDevitt’s alleged harassment was directed against an officer related to powerful and influential leaders within the department. Multiple cops said such behavior would have been spectacularly ill-advised — and somewhat implausible. 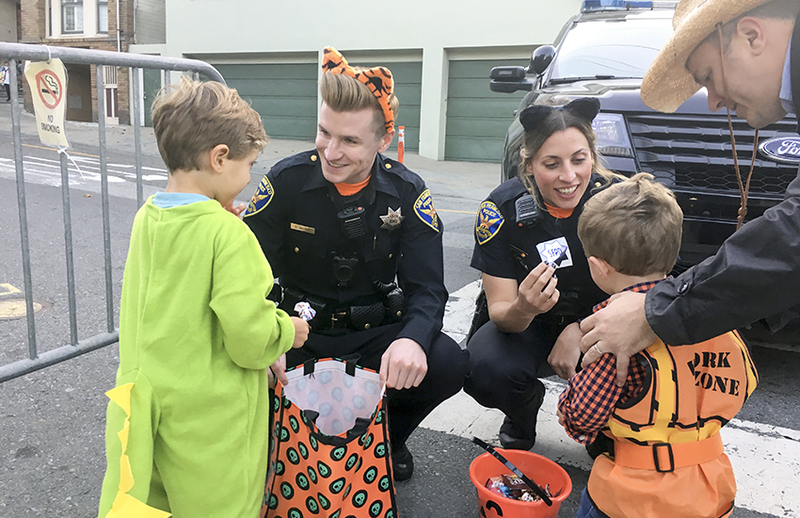 Outside of Central Station, Officers Brendan Mannix (left) and Jen Viceral (right) hand out the sweets to kids in the area. Photo by Susie Neilson. I was not aware that Officers ask for permission from a Sergeant to respond as backup to another Officer. That portion is BS. Any Officer worth their salt will respond to you code 3, as well as surrounding cops from other districts, and if he works in the daytime there is traffic. You can only go as fast as safely possible with all the people in the district. Market is pretty far, and is closer to tenderloin station. So I guess he’s saying Central Station cops didn’t back him and are lazy. Maybe someone should pull up that call for service and count who came up to back, at what times they came out, who showed up, where they came from, how long it took, what other units were on at the time the call came out, etc before we make that type of broad statement and claim all of Central was a no show. Yawn. This isn’t real. This guy is a shi**y cop gay or not. There are a ton of gay cops who are awesome at their jobs, have the full support and respect of co-workers etc. this guy just is not one of them, and it has nothing to do with his sexual preference. The is him grasping at straws and tarnishing the job on his way out. Maybe boot Mannix (term for new cops) should have spend more time learning this job rather than honing his prolific social media campaign about how awesome his skin is, how good looking he is etc. Huh….,you sound like a cops to me. Why don’t you get over yourself and cross over the blue line. Keyboard speaker. CO-WORKERS repeatedly abused him & harassed him as he very fem & gay in style & look & voice…and nothing done. 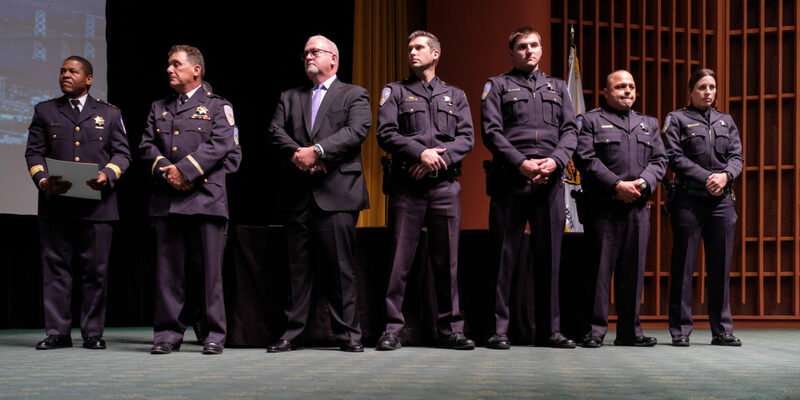 Same as his fellow new rookie cop, now fired, Mohammad Habib, ridiculed & abused & harassed for being obviously very Arabic ethnicity & Muslim religion, his being a lying slimeball & cheater @ OPD & elsewhere secondary. Thank you, Mission Local for your excellant continued following of police reform. Much respect for your journalism. Keep up your great writing. Anything new in the Officer Mannix or dirty ex-Cop Habib cases in 2019? Mannix still working or gone? Follow-up on big cases is even more important than a quick initial story reporting.